Print advertising revenues at newspapers in the first half of this year fell 25 times faster than digital sales grew, demonstrating the feebleness of the industry’s response to the shifting (shifted?) media landscape. 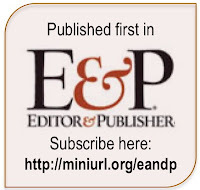 In the fist six months of 2012, the aggregate print sales of the nation’s papers fell by $796.8 million, or 8.0%, from the prior year, according to data released last week by the Newspaper Association of America, an industry trade group. At the same time, the NAA says, digital sales grew by $31.4 million, or 1.9%, from the same period in 2011. 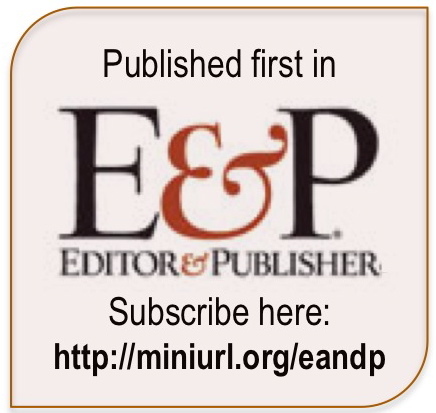 Thus, print sales in the first half of this year plunged 25 times faster than interactive revenues grew, notwithstanding the so-called “digital first” strategy – whatever that means – articulated by almost every publisher and editor. It's not that people aren't buying digital advertising. In the first three months of this year, total ad sales across all digital media in the United States climbed 15% to a record $8.4 billion, according to the Internet Advertising Bureau, an industry-funded trade organization. In the very same period, however, interactive ad sales at newspapers rose only 1.0% to $816 million, capturing a mere 9.7% share of the market. 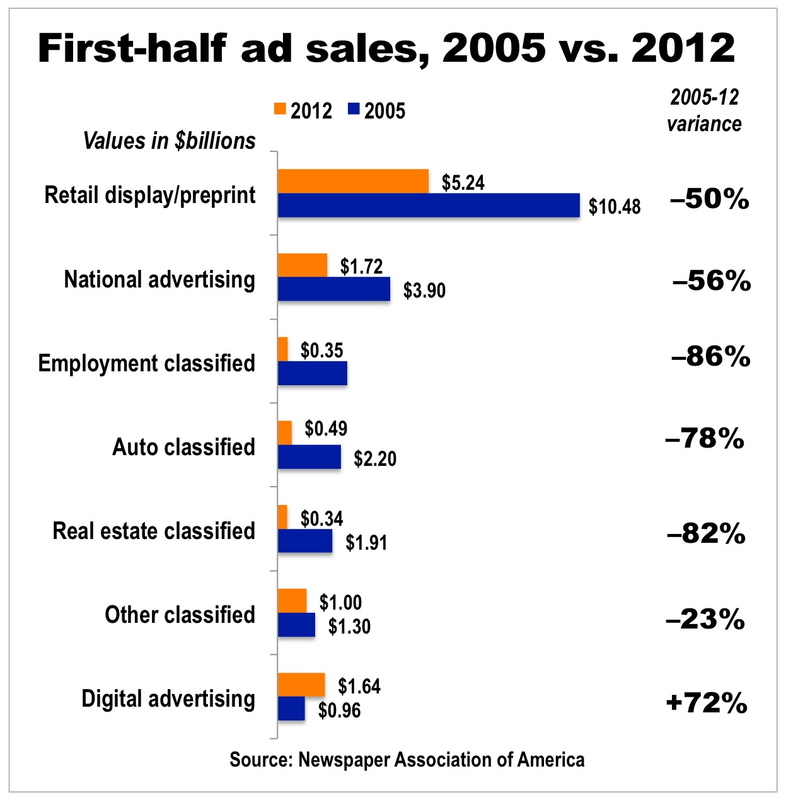 As discussed previously here, newspapers controlled as much as a 17% of the digital ad market in 2003 and had a respectable 15% share of sales as recently as 2007. Part of the shrinking share properly can be attributed to the dizzying growth in the last decade of the number of players in the digital advertising marketplace. But an equally significant part of the problem is that newspapers unimaginatively tried to export their formerly successful print business model to the digital realm. Since the debut of the web, publishers for the most part have had two ideas, which were based on the reach advertising model that served them so well for many generations: Charging a hefty fee for the dissemination of print classified ads on the web and selling print-like, run-of-site banner ads by the thousands. Although print advertising carried the day for newspapers for fully 10 years after the Internet entered the public domain in the mid-1990s, newspaper ad sales began falling dramatically after hitting an all-time high of $49.4 billion in 2005. In 2011, by contrast, combined print and digital sales totalled a bit less than $24 billion. And the decline has continued all of this year. 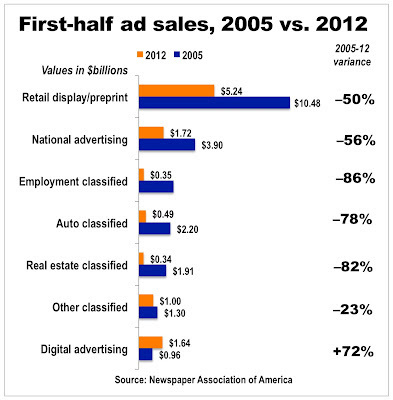 Owing to the meltdown that occurred over the last seven years in every category of print advertising (see the comparison below of first-half advertising between 2005 and today), publishers have ever-fewer customers for the anachronistic digital products they have on offer. This phenomenon is illustrated vividly in the staggering collapse of the classified business, which has shrunk by some 80% since 2005. Part of the classified decline, of course, resulted from the Great Recession that we have yet to fully exit. But, as discussed here, there also have been major structural shifts in the ways that consumers consume and marketers market. There is scant reason to believe the classified business will return to its former glory when the economy resumes operating at full speed. Next on the chopping block could be local retail advertising – the last significant remaining revenue stream for newspapers – for the variety of reasons discussed here, here, here and here. While the newspaper business has been shriveling, the native digital media have concentrated on developing not only huge audiences but also huge databases of information about those audiences. Now, they are selling access to the data about those audiences in a number of cost-efficient and highly targeted ways. As but one example of the phenomenon, see this. Because newspaper companies lacked the creativity and/or conviction to develop competitive digital formats in the nearly two decades since the Internet materialized, publishers today are struggling to pivot to a new business model that they call “digital first” – whatever that means – while managing through the seemingly relentless decline of their existing one. Mastering either of those tasks individually would be daunting. The challenge of doing both at the same time is nothing less than epic.